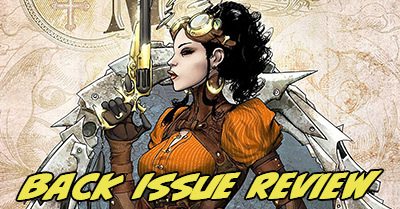 Back Issue Review: Black-Eyed Kids, Lady Mechanika, Warframe, and more! Welcome to another week of Back Issue Review! In this post, I share my capsule reviews of comic books I read that were not newly-released this month. My reading this week was entirely focused on non Big Two comics (that means no Marvel and no DC) and largely on checking out books with women protagonists I hadn’t read before. Unfortunately, most of those weren’t very good, but I did come away with a pair of new favorite titles, plus one I enjoyed but couldn’t commit to because we’re from such different worlds. [Read more…] about Back Issue Review: Black-Eyed Kids, Lady Mechanika, Warframe, and more!